Well, that was fast and furious! Arie Luyendyk Jr. was announced as ABC's new star of The Bachelor less than a week ago, but the network has already released its first promo for season 22, set to premiere in January 2018. E! News has your exclusive first look at the teaser featuring Arie, the race car driver and runner-up of Emily Maynard's season of The Bachelorette, as Bachelor Nation's new leading man in the video above, with the spot set to make its broadcast debut during tonigh'ts finale of Bachelor in Paradise. "Hearts will race," the teaser promises, combining footage of Arie, now 35, from Emily's season in 2012, with shots of him from the big reveal on Good Morning America. Even Arie was surprised when he received the call, having almost landed the gig twice before (Sean Lowe and Chris Soules ended up being chosen). "I was a little skeptical because we'd been in talks for a few years about doing it, so I just kind of went into it with an open heart, an open mind," he said on Good Morning America. "It just hit me that yeah, I'm here." And fans who watched season eight of The Bachelorette can rest easy knowing Arie is still more than ready to live up to his infamous nickname: The Kissing Bandit. "With the right woman," Luyendyk teased when asked if he was still the Kissing Bandit. So yeah, hearts will definitely race. 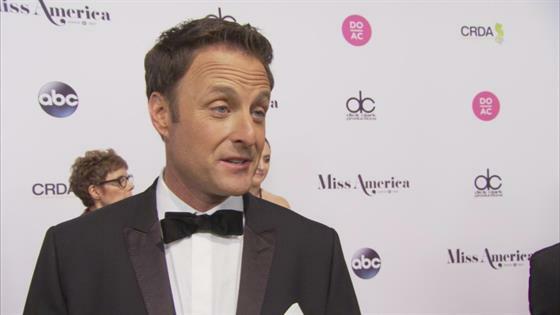 While some fans were less than thrilled over Arie's appointment, hoping it would be Rachel Lindsay's runner-up Peter Kraus, host Chris Harrison defended the show's casting decision when we chatted with him at the 2018 Miss America competition, which he hosted. "We chose Arie because he's great. I love Arie, I'm a little biased because he's a friend of mine and I've known him for several years, so I'm actually really excited he's the Bachelor. I think he's a very sincere good gentleman and I think he'll be a good one." To hear more from Harrison on the selection process, including if Peter could be the Bachelor in the future, watch our interview with him above. Arie's season of The Bachelor will premiere January 2018 on ABC. Bachelor in Paradise's finale airs tonight at 8 p.m. on ABC.